Simple & easy receipe yet very tasty. In a pan, add little oil & saute all the finely chopped ingredients. Add Potato, Paneer, Cilantro & Salt. Mix well for 30 secs. Keep aside to cool. Make balls or any shape from the cooled mixture. 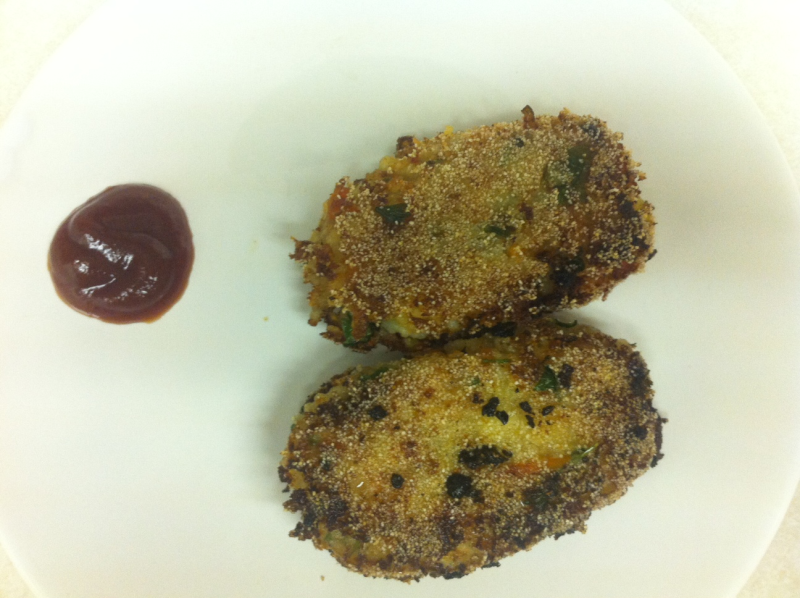 Dip the balls in the Corn Flour paste & roll it in Semolina/bread crumbs and deep fry or shallow fry till golden in color . Serve hot with tomato ketchup. hi... i would like to add here that if the boiled potatoes are strained as soon as they are done, then they become easy to handle and can be shaped well. Hi Khuserv...don't get disappointed. It happened to me also when i tried for the first time. They are very soft to handle & i was able to get it right with grt difficulty. You can try adding some breadcrums to the potato-Paneer mixture so that they absorb any extra moisture. Shallow fry them nicely on one side & then turn on the other side with a spatula & spoon very very slowly. This way they don't break. Keep smiling :) Thankyou. Hi me and my wife tried it out and for some reason they came apart. We were very disappointed can you tell us a way to keep it firm so that it doesn't come apart. Thank you.